‘Tis a sad thing indeed when a movie I saw when it was first released has reached the status of “oldie”. I recall Mancini’s score and the “look” of the film from James Wong Howe very well. You have reminded me that this is one due another look. Happy St. Patrick’s Day! Well, let’s just say that is a “goldie” then! Thanks for reading and happy St. Patrick’s day! 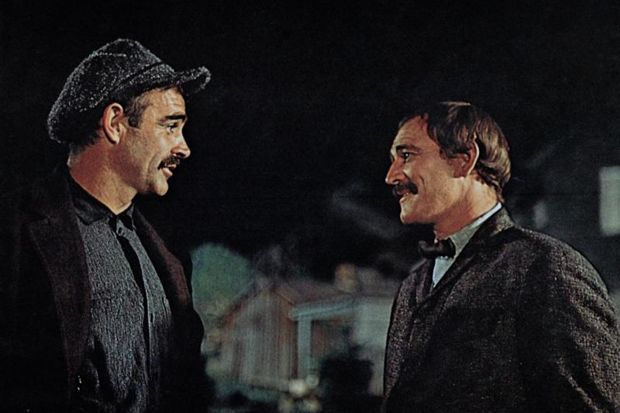 If the talents of Martin Ritt, James Wong Howe and Henry Mancini weren’t enough, Sean Connery and Richard Harris in a good old fashioned mustache-off is all the pitch needed to sell me on watching this film. I hope you enjoyed St. Patrick’s Day! It was by listening to Henry Mancini’s score to The Molly McGuires on a record that I became familiar with the film, but have yet to see it. Now that certainly must be amended! Thanks for participating in the blog o’thon and for sharing a great review of an often neglected film. My pleasure! Enjoy the film, it’s definitively worth your time.